Reason #3: Plan your honeymoon to Gabon. 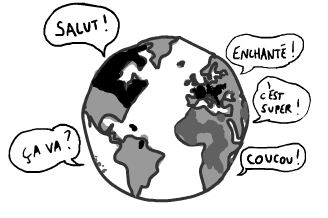 Did you know that French is spoken outside of France? We were skeptical at first too, but thanks to France’s glorious colonial history, French flows freely in 29 countries officially, and many more unofficially. French might prove useful (there’s a first time for everything) in these dream destinations: Wallis and Futuna, Vanuatu, Djibouti, New Caledonia, Burundi, Saint-Pierre and Miquelon, Burkina Faso, etc, etc. Ouagadougou ain’t your thing? Why not honeymoon to a country that doubles as a tax haven. Monaco, Luxembourg and Switzerland are perfect for all your sketchy financial transactions – No questions asked. Still not sold? With French at your disposal, you can finally make the trip to the ultimate exotic destination, the jewel of the Americas: Canada. Time to brush up on your bonjours, eh? Looking for more reasons to learn French? Stay tuned next week for reason #4: Become a cinema snob. A fair and objective look at the merits of learning French, brought to you by Frantastique.com, Online French Lessons. ← World Cup of English: Brazil vs. Denmark.